The chief technology officer at the U.S. State Department’s anti-propaganda center left last week, along with two other members of its analytics team, Defense One has learned. The departures raise new questions about the Global Engagement Center , the two-year-old office that remains leaderless nine months into the Trump administration. One former State employee said Borges was burnt out by a commute of more than two hours from his home in Maryland. Two other members of the analytics team quit at “around the same time” and departed on Friday, the former employee said. Neither analyst responded to requests for comment by press time. The Obama administration established the GEC in 2016 to counter ISIS’ various online messaging efforts, directing the new office to use data and to work with international partners in a bid to undermine extremist propaganda more effectively than State’s previous such unit, the Center for Strategic Counterterrorism Communications. GEC’s toolbox included various outreach efforts, including highly targeted ad buys on Facebook. Last year, the 2017 National Defense Authorization Act gave the GEC an additional mission: fighting “foreign propaganda and disinformation directed against United States national security interests and proactively advance fact-based narratives that support United States allies and interests.” The Act, which became law in December, allowed the Global Engagement Center to ask the Pentagon for $40 million, bringing its total 2017 spending to about $80 million. About $60 million of that was to be used to counter Russian influence operations; about $19 million was aimed at ISIS. Tillerson relented at the end of August, agreeing that the State Department would complete its Pentagon request and put the funds to work. 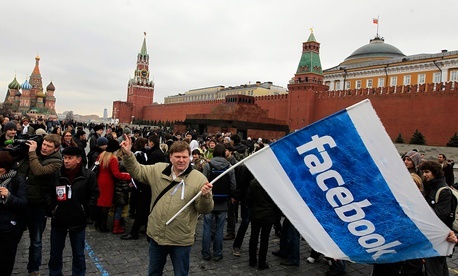 Last week, the GEC’s anti-propaganda mission rose to national attention again when it was revealed that the Kremlin had purchased Facebook ads worth $100,000 in the runup to the 2016 election. The ads “appeared to focus on amplifying divisive social and political messages across the ideological spectrum — touching on topics from LGBT matters to race issues to immigration to gun rights,” Facebook chief security officer Alex Stamos wrote in a blog post . Analysts are still trying to figure out the reach and impact of the Kremlin’s ad buy effort. But with the right user data, $100,000 buys a lot of influence on Facebook. At the Defense One Summit last November, former GEC director Michael Lumpkin described how the Center was using the data it received as a Facebook advertiser to maximize the effectiveness of its own targeted appeals. Facebook can’t sell personally identifiable information directly to advertisers. But ad buyers can use the vast amount of data Facebook collects on its users to target their ads extremely precisely. In the FCC financial disclosures that the company filed before its 2013 IPO, company officials estimated that they had an average of 111 megabytes of information per user, which may have even been conservative at the time. Unless you log out of Facebook every time you navigate away or disable the app on your smartphone, the company continues to collect information about the pages you visit as you move about the web. That’s one reason why the ads that people see in their Facebook feed reflect other activity or sites they visited on the Internet. Recent research from Christoph Aymanns, Jakob Foerster, and Co-Pierre Georg shows that a troll farm or influence operator — they call such actors “adversaries” — can use just a small amount of personal information about a person’s belief system and their social structure to greatly increase the likelihood that an individual will accept what they are being told. As Aymann’s, Foerster’s and Georg’s work shows, an ad-buyer can easily use that sort of precision to target messages to individuals more likely to believe them. The 2017 NDAA allows the GEC some leeway around privacy restrictions, so long as there is clear oversight in place in how the Center uses the personal information that it obtains. The law also specifies what the GEC can do with that personal information — it can, for example, use it to improve targeted campaigns. “Research and data analysis of foreign state and non-state propaganda and disinformation efforts and communications related to public diplomacy efforts intended for foreign audiences. Such research and data analysis shall be reasonably tailored to meet the purposes of this paragraph and shall be carried out with due regard for privacy and civil liberties guidance and oversight,” according to the NDAA. But State Department is not currently taking advantage of this, according to several former State employees, which could be one reason why the analytics team was in such disarray. State Department officials declined to provide an on-the-record response.